Come see History on the River as the Dorchester Skipjack Committee hosts the 23rd Annual Choptank Heritage Skipjack Race! This event features the traditional oyster dredging boats that are unique to the Chesapeake Bay. About 26 actively sailing skipjacks exist today. 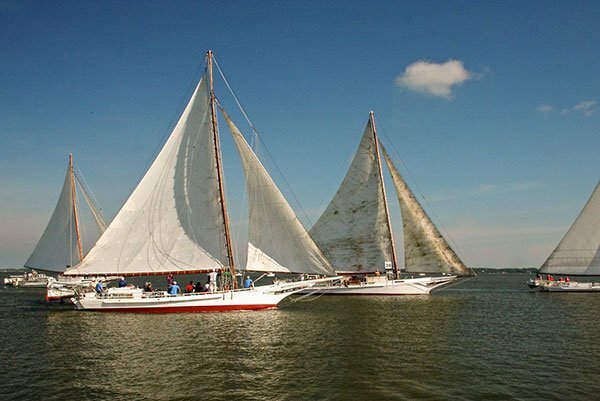 The Choptank Heritage Skipjack Race expects 10-12 to participate in this year’s race. The event takes place Saturday, September 21, with a parade of boats at 9am, followed by the race at 10am. Grounds open at 8:30am. The parade and the start and finish lines are all close to Long Wharf Park, at High and Water Streets in Cambridge, MD. A small Skipjack Festival will also be held at Long Wharf Park, with food vendors, and exhibitors. The Choptank Heritage Skipjack race is one of only two such events worldwide. It attracts regional and maritime historians, boating enthusiasts and professional photographers from all over the country. This a free event and everyone is invited to see these historic boats, including several that are more than 60 years old, as well as a few that are over 100 years old. The race viewing area is at Long Wharf Park, at the foot of High Street in Cambridge. Grounds open at 8:30m. For more information, call 410-228-7141 or visit www.skipjack-nathan.org.